Asia in general is known for its… amusing… ways of translating things into English. Store names, product slogans, t-shirts… you name it. I’ve been trying to document all the “Engrish” I’ve seen in Taiwan for my own amusement, but it occurs to me that you, the good strong reader, might want to be amused as well. And so this is a semi-regular installment here on Nick in Asia – not to poke fun, mind you, but belly laughing a few times is always good for the soul. As I mentioned in my triumphant return blog, I sent out Christmas cards to a few people this holiday season. Usually, I’m not really the Christmas card type. There’s so much writing and effort involved. And then you have to mail them, and that usually involves some combination of addressing envelopes and buying stamps and wearing pants. But this Christmas was obviously a little different. I actually wanted to send out Christmas cards – I think it was a way for me to fight through my homesickness, as well to feel like I was really keeping in touch with people back home. Facebook’s all well and good, but it’s always nice to receive an actual card or letter in the mail. It shows that someone really was thinking about you, and that they went to the effort of putting on pants to do it. 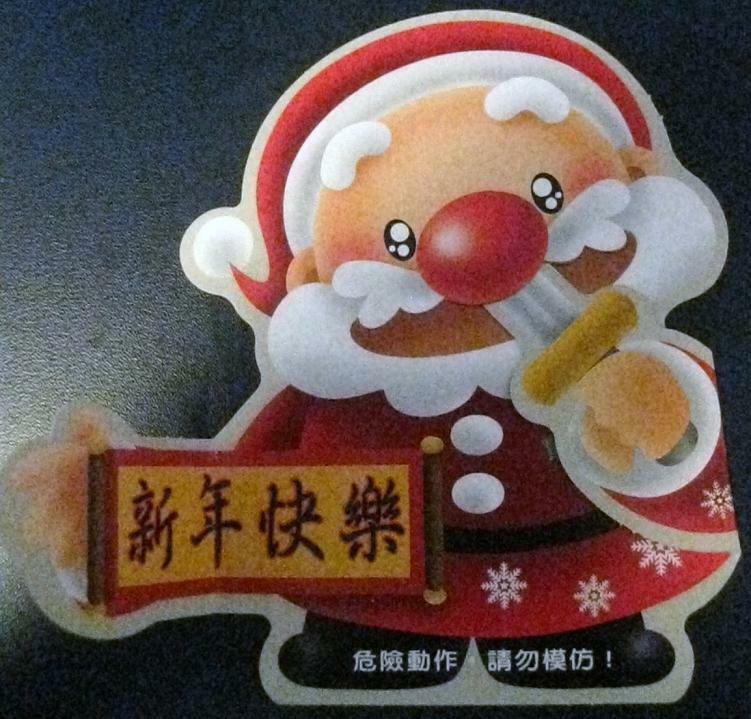 So a couple weeks before Christmas, I set out to find some Christmas cards, and I had a revelation: I’m in Asia. There’s Engrish and other wackiness all around me; surely, I can find a few wonderfully insane cards to send to folks back home. I went to a huge stationary store (don’t think of like a Hallmark store in the mall; these stores are all two or three floors, and they sell everything – think of Staples mixed with Michael’s, with a dash of some good old-fashioned Asian nuttiness mixed in). I found the Christmas card area and went to work. Within about half an hour, I’d found some gems. The rest is history: I just used the same six cards a few times. They were too good to branch out to anything else. Some had straight up Engrish; some had insanity; some had cats; one even had a pantsless Santa and Rudolph being held up at gunpoint. All of them brought me great joy and filled my soul with a holiday tingle I’d never felt before. I hope they make you feel the same. See them all after the jump (complete with transcriptions of the Engrish)! As I implied in yesterday’s post, living here in Taiwan affords me the opportunity to live a completely different existence from back home. Ok, well, it’s not completely different, I suppose – the sun still rises in the east and sets in the west, everyone wears pants (for the most part), and the Yankees are still the most popular sports team. But much of life here is a bit inconsistent with what I’ve grown up with – the temples at every turn, the hand gestures that just confuse me, the food that confuses me even more, the smells that would offend most in other developed countries… and of course, the holidays. But it’s my job here that’s probably the biggest change from what I had back home. I’m a teacher here. An English teacher. For little kids, mostly. Little Asian kids. Now, I realize that in my 5+ months of teaching and blogging, I haven’t talked about my job too much. And that’s my bad. You deserve better, and a teaching-centric post will be forthcoming. But I’ll just tell you this now: I really like teaching. It’s exhausting and challenging and it wears quite thin on my already fragile patience. But being able to connect with these kids, to plan out how you want them to learn, then to execute that plan, and then see them learn… it’s really, really neat. 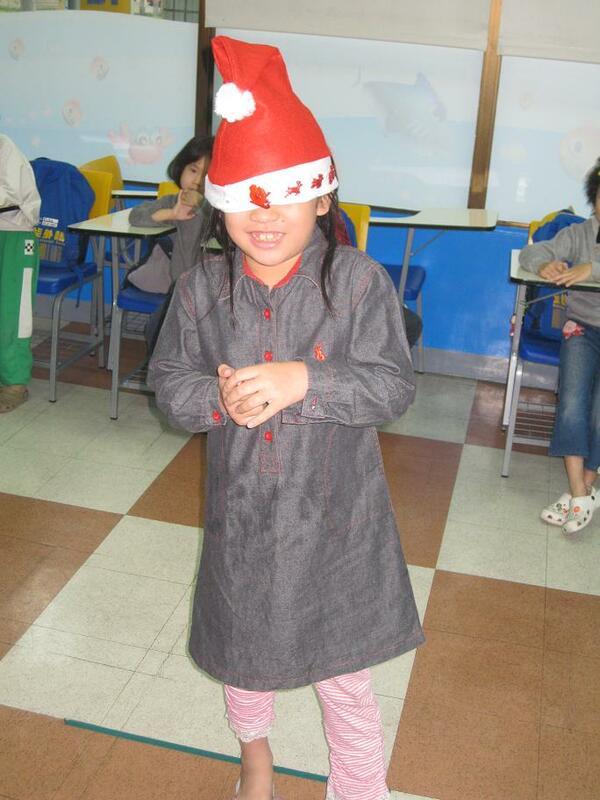 The Christmas holidays brought with them the end of my first semester as a teacher in Taiwan. Now, most English schools over here (like mine) want their students to get the complete flavor for life in the Western world. 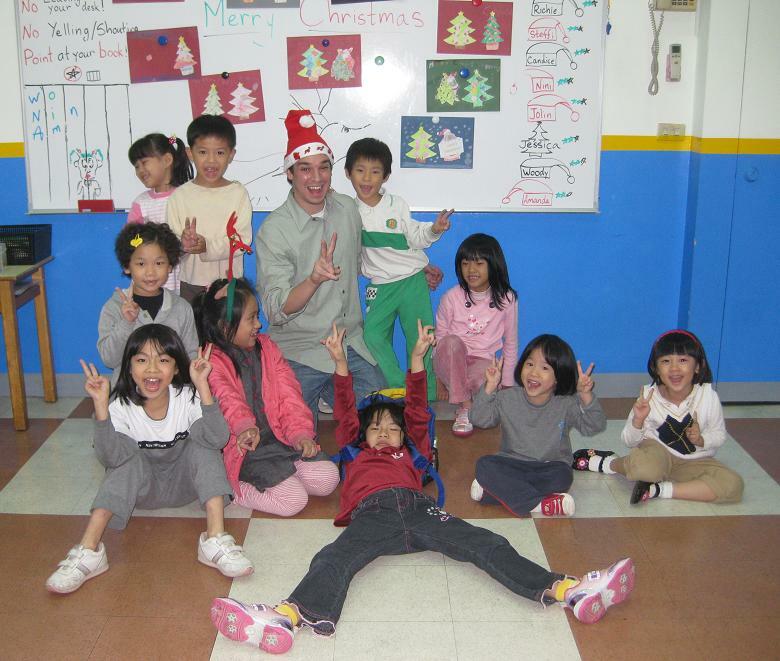 And so even though most of these kids don’t celebrate Christmas at all – they all have to go to their Chinese school on Christmas day – most of their English schools decorate for Christmas and have Christmas parties for the students. My little Schoolhouse branch was no different. They decked out our lobby to the Yuletide nines, complete with a Christmas tree, fake presents underneath, stars hanging from the ceiling, snowflakes in the windows, and a giant inflatable Santa riding some sort of gasoline-powered snow plow. I wish I’d taken pictures. Forgive my foolishness. Now, just so you know, I’m one of the lucky ones. Remember when I got hired by Schoolhouse, and I said I realized how lucky I was? Right. Well, our cluster of five branches are five of the only English schools who close down over the holidays. We got two weeks off, and it was glorious. Most schools, though, only gave their teachers Christmas Day off, and some of my friends even had to work on that day. So yes, I’m lucky. And so, before I bid farewell to my students for 2009, we had ourselves a little Christmas party. Now, again, most of these kids don’t celebrate Christmas. They kind of know what it is, but only from the decorations and commercials they see, and what their parents tell them. We didn’t have like one big school-wide party. Each individual class had it’s own little shindig inside the classroom during their class time. I teach six different classes – two of them are upper level and would have no interest in celebrating anything except computer games and money; and one I teach at another branch, and they did their own Christmas thing over there. 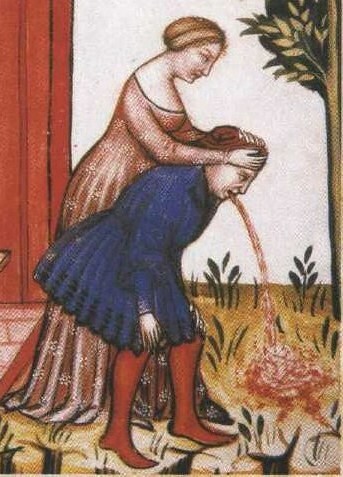 So I partied with three of my classes, all lower level (between 5 and 10 years old), and all so much fun. I brought in my ipod and computer speakers, and played Christmas carols for them. They had no idea what they were listening to, but they seemed to enjoy it enough. I thought about downloading “A Very Metal Christmas” to play for them, but ultimately decided against it. The first thing I did with my classes was play “Pin the nose on Rudolph.” I drew (well, attempted to draw) Rudolph on the whiteboard, pulled my Santa hat over a kid’s eyes, spun them around, and let them have at it. Apparently, when you’re six, you think this is the greatest thing in the world. After that, when they were sufficiently tired, it was crafts time. I had them color a couple Christmas pictures, then cut them out, and then paste them onto colored paper – green, red, black, gray, or blue. Then they wrote “Merry Christmas” on their paper and then drew snow or angels or robots or dinosaurs or whatever tickled their fancy. Again, simple, but surprisingly effective. And that was the most Christmas-y thing I did all holiday season. But I loved it. It’s crazy, the bond you can develop so quickly with these kids, and vice-versa. For a couple hours anyway, I tried to give my little students a Merry Christmas. And in return, I got a little one of my own. After the jump, check out the gallery of pictures from the Christmas parties with two of my classes! Well, that lasted awhile, didn’t it? My last post was nearly a month-and-a-half ago. By my – and your – standards, that is simply unacceptable. It wasn’t that I planned on the extended Christmas hiatus, but looking back, I think it was necessary, to a degree. I needed a little break. I needed to recharge. I needed to focus on my life here a bit – namely, lesson planning for all my classes for the two weeks after the Christmas break (you know, the two weeks that starts today). Also, there was the matter of Christmas parties, of writing Christmas cards, of getting ready for my Thailand trip. And, sadly, some of my dearest friends here – specifically, Erika and Renata – packed their things and left Taiwan for good. Erika moved back to Canada, and Renata headed to Australia to carve out a nice little existence there. So, you know, there was much quality time to be had with them and all of our friends. So anyway, yeah… my sincerest apologies. I’m sure you all had your own Christmas/Holiday/Hanukkah/Boxing Day/Kwanzaa matters to attend to yourselves; you probably didn’t even realize Nick in Asia had been dormant. Well, now you do, and now we’re together once more, finishing off the expired eggnog, cramming ornaments and decorations out of sight and mind, and wondering once again what our lives will be like when we drag them back out again in 11 months. What I’d like to do though, over the next couple of days, is backtrack just a bit. I didn’t write anything on here for the last month-and-a-half, but that doesn’t mean I didn’t have things to write. Despite what I may have said just a few paragraphs up, I think, above all else, I was just lazy, and that’s why our little blog has gone unattended to. First things first, though. I hope that you and yours, dear readers, had an absolutely wonderful holiday season. I hope Christmas (or whatever it is you celebrate) was a rousing success, and I hope you rang in 2010 with both fervor and aplomb. So decor was up; many shops and stores were playing Christmas carols; it was even pretty cold out for the entire month. I can’t remember the last time I wore shorts here, or the last time it wasn’t at least a little chilly on the deathcycle at night. But still, something was off. I’m sure it had a lot to do with being a bit homesick and missing my friends and family at this, my most cherished time of year. But there was something else. It was like, you knew it was Christmas, and it kind of looked like Christmas, but it sure as hell didn’t feel like Christmas. You know how the holidays just have a feel to them? The reds, the greens, the lights, the pine and peppermint smells, the music, the smiles, the bourbon, the cookies… all of it becomes intertwined within you, and your soul dons a Santa hat and dances for a month straight (though that could just be all the cookies and bourbon causing indigestion and impairing my central nervous system). Maybe I’m just projecting my own personal feelings about the holidays onto everyone, but I’m sorry. I don’t care. I can do that. It’s my blog. 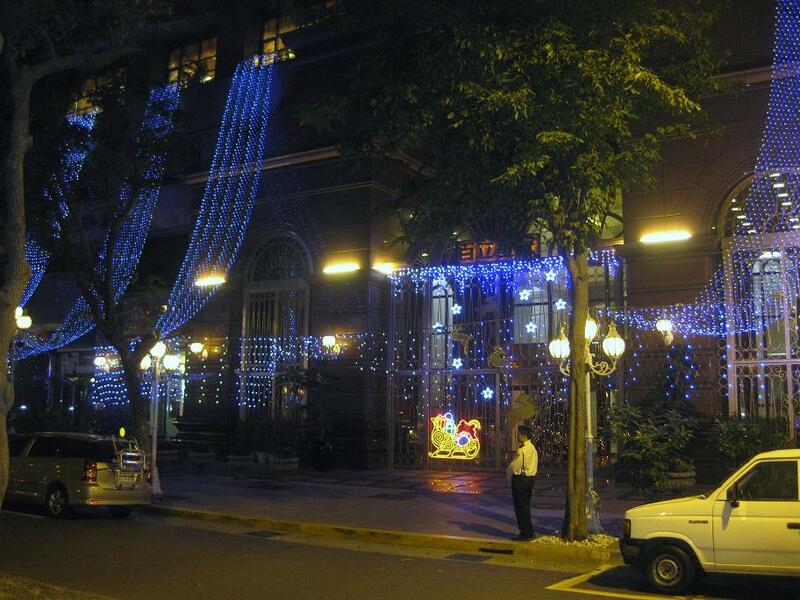 Well, Taiwan, try as it might, doesn’t really duplicate that holiday feel, that Christmas vibe. The lights were up and the carols were filling the cosmetics floors, but it pretty much stopped there. No one wished you Merry Christmas; there were obviously no (real) pine trees anywhere, and peppermint was scarce; no one (save for a few of my friends) even mentioned the phrase “Christmas shopping;” and of course, the name Jesus rings no bells for these people. Of course this is how it is, though. Most of these people aren’t Christian and never have been. Why would they celebrate Christmas? Why would they even care? Which leads me back to the decorations. Why would they even bother? Is it for me and the other Westerners that comprise maybe .05% of Kaohsiung’s population? The question haunts us all. So I guess it was nice to have them up, but like I said, there was no holiday vibe that came along with it. It was like a teenager whose mother makes him write a birthday card to a relative in Bolivia he’s never met – you could see the card and read the words, but the spirit of it all fell flatter than Debra Messing. Ok, now (here comes the catharsis! )… I realize everything I’ve said up above was written from a perspective of what I’m used to, what I’m comfortable with. But I didn’t come on this little adventure expecting to be comfortable all the time and experience all the things I’m used to. So even though my holidays were different and I missed my family and friends back home, I made my own, new adventure. I have new holiday stories. 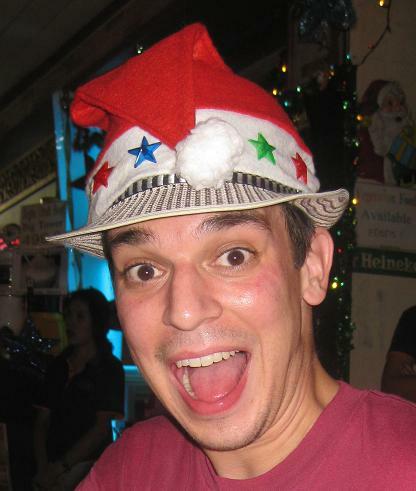 I had Christmas parties with my students; I found excellent Engrish Christmas cards and sent them off to folks back home; AND, I spent Christmas and the subsequent days in Thailand, losing money but gaining perspective. Also, I turned 30. So there’s that. I’ll be writing about all of that and more in the coming days. Thanks for coming back. The place wasn’t the same without you. Well, it’s Friday morning for me; Thanksgiving night if you’re reading back in my homeland. I’ve had a splendid morning – woke up early, talked to my family via the magic of Skype, and watched the Cowboys win. I hope your Thanksgivings were the stuff of legend, punctuated with an endless trail of gravy. But enough rambling. Here are some things I wanna tell you. Let’s do it quick-hit style. Initially, I was going to tell you that despite living in this tropical climate, it finally was kinda feeling like fall (or something resembling fall) here in Kaohsiung. But as I write this, it’s 11:15 am, and it’s currently 84 degrees outside. As my kids say when they’re disgusted, Aye-yuh! This is not fall. This is madness! Well, ok… it is cooler now than it ever was in July or August or September. We haven’t seen a high above 90 in maybe a month. So that’s all well and good. But last week, it was cold. Or again, cold-ish. The highs were still in the upper 70s or low 80s, but the nights were downright cool. Maybe even all the way down in the 60s! Ok ok, that’s not really cold at all, and as a lover of autumn and the like, it’s not much. But, let me tell you this: riding around on a scooter when it’s 50 or 60 can get pretty damn cold. Perhaps I should invest in a full-head helmet; or perhaps some riding gloves; earmuffs? Or maybe I’ll just figure out a way to bottle molten hot lava, stash it in my little under-seat compartment, and give myself a nice little ghetto seat-warmer. So as we all know by now, I will not be going back to the States for Christmas. It saddens me, but it’s true. However, as I mentioned in my last post, how often am I gonna be living in Southeast Asia? I need to be taking advantage of all the beauty around me that’s so close, and so cheaply available. And so I’m going to be in Thailand for Christmas and New Years. I’m meeting some friends in Bangkok on the 26th, but I’ll actually be in Thailand on my own for the 22nd-25th. So yeah, I’ll be alone for Christmas day, but I’m actually somewhat excited for that. I can do whatever I choose and go wherever I want. In all likelihood, it’ll involve Thai food, some sort of cocktail, and the beach. This is good. And then, on the 28th, said friends and I will travel down to Koh Samui for some sort of epic New Year’s party that they have there every year. New Years Eve will also be my 30th birthday. I have no idea what to think about this. But the whole experience should be great, and I’m pretty damn excited. I’ll keep you posted. Also, if you have any ideas/suggestions of places for me to go while in Thailand, please do share them with me. Your support and generosity power my soul. Speaking of going places, I’ll be in Taipei for the weekend with some teacher friends from school. I haven’t been there since my first five days in Taiwan. Now that I have a slightly better grasp on this country, I’m pretty excited for the getaway. I’m gonna try to hit up the National Palace Museum on Saturday, and some hot springs on Sunday. You will find out soon enough if I am successful in fulfilling these endeavors. It actually is going to be cold in Taipei. Like, real actual cold. Do they have lava for sale there? …but I’m a bit apprehensive. You know why. Wish me luck tonight. Last Thursday night, I was sitting at my little desk in my little classroom that I use twice a week at our sister school. It was break-time, and I was grading papers. The classroom door was open, and Keith, an Irish gentleman who’s been teaching over here forever, leaned in. I sat back and had to think for a second. Was it Thanksgiving? I hadn’t become completely oblivious to life back home, had I? Were the Cowboys playing at 5 am the following morning? No, no they weren’t. It wasn’t Thanksgiving. That was next week. I related this all to Keith, but thanked him nonetheless for his charming well-wishes. And then it hit me. No, this wasn’t American Thanksgiving – next Thursday was; but next Thursday would be the same as this Thursday – I’d be teaching English all day, eating rice or noodles when I got the chance, and coming home exhausted. And when it actually was Thanksgiving, Keith would probably pop his head in the door and extend his well-wishes again, and I’d be pretty sad that I was sitting in my little desk in my little classroom, instead of eating turkey, laughing with my family, watching football, and playing games. I fully realized when I signed up for this adventure that homesickness would be part of the toll. And every so often since I landed here in July, I have gotten a bit homesick. It never lasts very long – maybe an afternoon or a whole day; certainly nothing emotionally crippling. But as summer has turned into fall, I have started to get that little twinge a bit more often. Seasons are changing back home (and here, to a far lesser extent, weather-wise), and I guess subconsciously I’m fully realizing that I’m gonna be away from home for a good long while. I do love this time of year back home, too. I miss taking walks with Bonzo in the crisp autumn air; miss being a 3-hour drive from my mom and my childhood home; miss going to the State Fair – there’s something magical about eating corny dogs, playing corny games, riding rides, and perusing booths selling everything from shampoo to the Sham-Wow; I miss playing with my friends, and watching football at normal hours. In Part 6a of this ongoing and award-winning Engrish series, we looked at several hats I saw while spending a weekend in Kenting. As I’ve mentioned before, these adorable yet horribly wrong attempts at English are all over the place here, and I’m going to try to take more pictures of it. But it’s hard to be inconspicuous as a white person in an Asian land when you’re taking pictures of things written in English while laughing hysterically. Especially when those things are written on someone’s chest, or their head. Ahhh well. I do it for you. One thing that I had not seen prior to arriving in Kenting, though, is what we’ll be focusing on today. Remember, I said last time that 6a would focus more on the Engrish, while 6b would have more of a Chinese Insanity flavor. Well, here we are. As I told you, the couple of main streets in Kenting had all sorts of clothing shops for the beach-goer in you (flip flops, board shorts, t-shirts) or for the Asian beach-goer (big sunhats, long-sleeve jackets, and SPF 14,500 sunscreen). Well, quite a few of these shops had mannequins proudly displaying their ware. 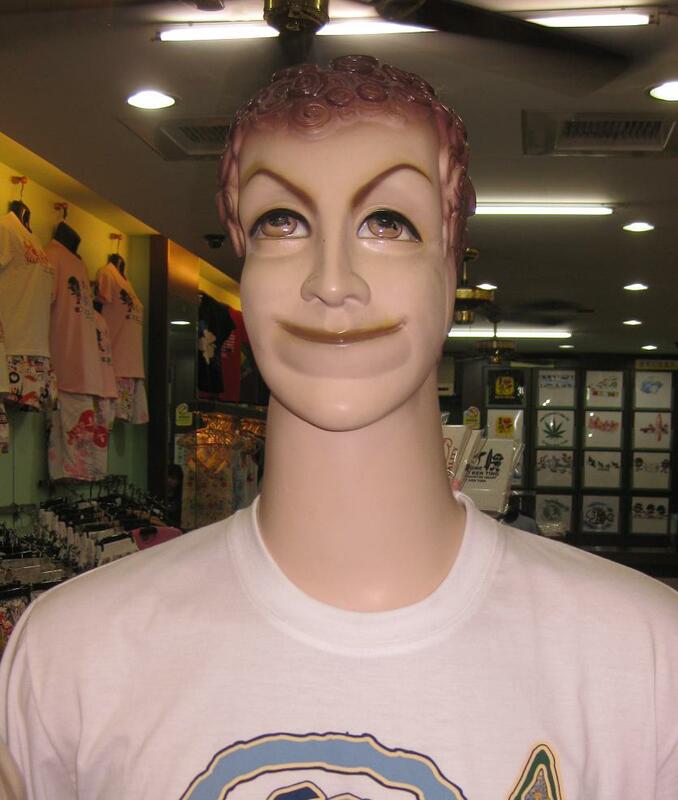 Now, I’ve always found mannequins a bit unnerving, what with the impeccable fashion sense, the dismissive attitudes, and the vacant stares. But let me tell you, the simple mannequins of the West have nothing on their counterparts here. These mannequins were some of the creepiest things I have ever seen with my own two eyes. They had personalities and life sculpted into and painted onto their faces. I suppose they’re made this way to appear more lifelike and make Johnny Consumer more inclined to buy the clothes hanging from them. But I fear it has the opposite effect. We were all too busy recoiling in horror from the crazed stares these mannequins were giving us that we never even much looked at the merchandise. And they all looked different, too! It was like the proprietors of these stores had killed a band of gypsies, taxidermied them, and then dressed them each in a different shirt/shorts combo along the street. Truly disturbing. So there’s some Chinese insanity for ya. Enjoy the mannequins after the jump. Do not look them in the eyes. I then giggled hysterically to myself for 5 minutes.